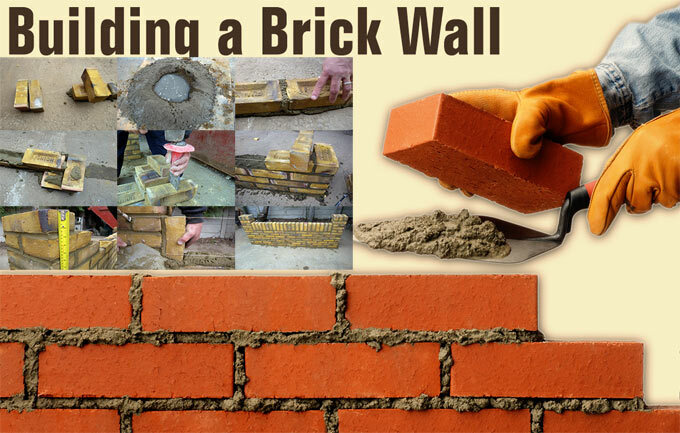 Bricklaying is treated as one of the most vital construction skills specifically when the structural walls are constructed. In this useful construction article, you will learn the step-by-step methods to construct a garden wall. The steps involve setting out the footprint and maintaining level and square to blend the mortar, bedding the bricks and finishing joints efficiently. Prior to start the project, find out the number of necessary bricks. Standard types are 215mm x 102.5mm x 65mm. To obtain a perfect result, there should be 10mm mortar bed. Now, enter your brick size as 225mm x 102.5mm x 75mm for standard products. Step 1: As soon as the foundation is set properly, arrange the bricks at both ends of the wall where the pillars will be constructed. With the help of the string line, create a straight guideline at brick height among the two exterior bricks. Step 2: Stack five shovels filled up with sand and one of cement on an old board. Turn shovel for being blended with a uniform color. Create a central hollow, pour in water and mix. Reiterate the steps unless a smooth, creamy texture is produced that’s wet but not excessively loose. Step 3: Place a 1-2cm mortar bed along the string line. Start from one end, place the first brick and tap a little to ‘bed in’. ‘Butter up’ one end of the next brick with mortar and abut it to the first. Reiterate with string line as a guide. Step 4: At the point where the pillars should be located, arrange a brick side-on to the end of the wall. While constructing the wall, each successive course of pillar bricks should be placed in the opposite direction. Step 5: While constructing pillars, at specific courses, it is required to place half-bricks. To create a cut, arrange the brick on its side, trace the bolster at the split point and strike the head tightly by a club hammer. It should rupture neatly first time.